There are instances where we are left deeply impressed when we meet someone. The meeting may be only for a few minutes, but we are left with the feeling that we want to stay and know more about the person we met. Such people exude an indescribable charm and influence, so much so that we do not want to part from them. These are situations that each one of us cherish and remember and feel that something within us changed after the meeting. The meeting between Sri Ramakrishna Paramahamsa and Narendranath Dutta was something that not only changed young Narendra’s life forever, but also gave the world an extraordinary messenger to spread the thoughts and philosophy of this great saint of Dakshineshwar. As a young man, Naren had the build of an athlete, a resonant voice and a brilliant intellect. At college, he studied and absorbed western thought, and this had implanted a spirit of enquiry in his mind. He was constantly trying to reconcile his own inborn tendency for spirituality, his respect for ancient religious traditions and beliefs, and his own spirit of enquiry. He had tried to find comfort in the Brahmo Samaj and had met different religious leaders but could not get a convincing answer from them to his questions about the existence of God. It was at this critical juncture that Professor William Hastie was discussing in his class ‘ecstasy’ as described by Wordsworth in his poem ‘The Excursion’. Hastie mentioned that the saint who lived in Dakshineshwar, just outside Calcutta had experienced such ecstasy. Narendra was also prompted by his cousin Ramachandra Dutta to visit this saint. Thus came about in 1881, the historic meeting of these two great souls, the prophet of modern India and the carrier of his message. Narendra was then 18 years of age. He entered Ramakrishna’s room with some friends and sang a few songs on his request. Ramakrishna went into a samadhi listening to these songs. 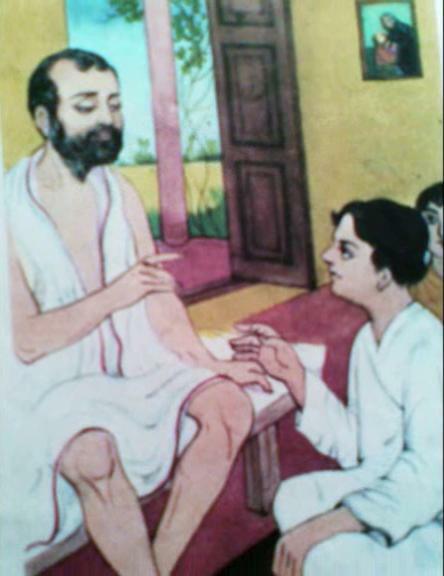 A few minutes later, Ramakrishna took Naren by his hand and led him outside. There he addressed him tenderly and spoke to him as though he knew him for a long time. He asked him, “Why have you come so late? Why were you so unkind and made me wait for this long?” He addressed Naren as Narayana born on earth to remove the misery of humanity. He held his hand and asked him to come again, alone and very soon. Naren was startled and wondered why he had come this far to see a mad man. But returning to the master’s room, Naren found in Ramakrishna’s words an inner logic, a striking sincerity and a convincing proof of his spiritual nature. In answer to his question “Sir, have your seen God?”, Sri Ramakrishna answered “Yes I have seen Him just as I see you here, only more intensely”. Naren had finally found someone who could assure him from his own experience that God existed. His doubt was dispelled and that was to be the beginning of his initiation and training. This was just the first of several meetings between them and soon Naren became convinced of Ramakrishna’s spiritual attainment and became his most ardent devotee.